We’d love your help. 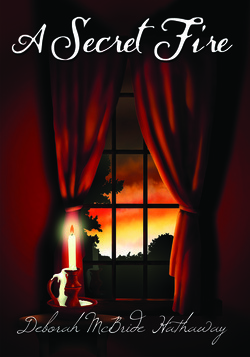 Let us know what’s wrong with this preview of A Secret Fire by Deborah M. Hathaway. In the small, western town of Thunder Creek, Emma Marchant leads a simple life, her days spent by picking wildflowers, dodging the unwanted advances of the town drunk, and running her family-owned inn with her brother and his wife. Though ever-cheerful on the outside, Emma can’t help but long for something more. Finally, a promise of change comes when cowboy Thatcher Deako In the small, western town of Thunder Creek, Emma Marchant leads a simple life, her days spent by picking wildflowers, dodging the unwanted advances of the town drunk, and running her family-owned inn with her brother and his wife. Though ever-cheerful on the outside, Emma can’t help but long for something more. Finally, a promise of change comes when cowboy Thatcher Deakon rides into town in search of a room at the Marchant Inn. After an awkward first encounter with the handsome man teasing a blushing Emma, their lives become intertwined with horse rides, barn raisings, and peach cobbler. To ask other readers questions about A Secret Fire, please sign up. Feb 2013: Re-read for book group. Such a cute story. Aug 2012: I really enjoyed this one. I was quickly sucked into the story by Emma’s endearing character. I thought Emma was really likable, a bit shy at times, but a sweetheart. Thatcher was a doll, I fell for him right off the bat, just like Emma. I thought they had good chemistry and some really nice moments together (Mmmm, kissing in the rain!). It really is a sweet story and full of that good old western charm. I even got a kick out of snobb Feb 2013: Re-read for book group. Such a cute story. Aug 2012: I really enjoyed this one. I was quickly sucked into the story by Emma’s endearing character. I thought Emma was really likable, a bit shy at times, but a sweetheart. Thatcher was a doll, I fell for him right off the bat, just like Emma. I thought they had good chemistry and some really nice moments together (Mmmm, kissing in the rain!). It really is a sweet story and full of that good old western charm. I even got a kick out of snobbish Nancy Jane, she was quite mean-spirited, but added a fun element to the story. I thought the story was well written and moved along nicely. I also liked Eliza, Seth and James who were all fun characters and added a lot to the story. I’ll definitely be rereading this one! Oh, and not that its bad, but I'm not a big fan of the cover. Maybe something with wildflowers would be nice, but it's okay. Overall, a very enjoyable read, at times it reminded me of Marcia McClure (which is a good thing), so if you enjoy her books you’ll enjoy this one just as much! Thanks so much to the author for a review copy, I loved the story and look forward to reading more from Deborah McBride Hathaway! This book was full on Texas twang. Thatcher is strong and fills the pages with his essence. I loved his character. Emma was sweet, but I wanted to shake her so many times. She was such a doormat! Her character definitely has the most growth in the book. By the end she found her confidence and her moxie which was a relief! Wow!! It's been awhile since I've read a kindle book that I absolutely love!! I thought the dialogue was very real and flowed well; the interactions between characters was realistic as well. I felt like I could see inside the characters and understand them and what made them tick, yet I got a great story in the process. I don't believe we're given a time period, but I believe it's probably 1800s western (telegraphs, horses, words used, etc). Emma's parents have passed away and she is living with Wow!! It's been awhile since I've read a kindle book that I absolutely love!! I thought the dialogue was very real and flowed well; the interactions between characters was realistic as well. I felt like I could see inside the characters and understand them and what made them tick, yet I got a great story in the process. I don't believe we're given a time period, but I believe it's probably 1800s western (telegraphs, horses, words used, etc). Emma's parents have passed away and she is living with her best friend and sister-in-law, Eliza, and her brother, Seth. They run an inn in town and when two handsome cowboy brothers show up looking for a room, Emma is thrown into a world of confusion and love. Emma and Thatcher both have insecurities that threaten their relationship. It was nice to see even a manly man feel those kinds of feelings, instead of being all tough and almost feelingless. Emma had a lot going for her, yet she refused to see and believe that someone like Thatcher could possibly be interested in her. Sometimes those types of heroines are annoying, but Emma wasn't. I loved it from beginning to end and look forward to more of this author's works. This was such a cute book and I could not put it down. I really enjoyed the characters. For some reason I enjoyed the simpleness of the life. I enjoyed that what they wanted most was to be married and have children(at least that was our main characters, Emma's dream) and it was a simple dream and I liked it. I liked the fact that this in and of itself was a dream to aspire to. As a friend just recently reminded me I get to live my simple dream everyday and it brings me so much JOY! Maybe this is This was such a cute book and I could not put it down. I really enjoyed the characters. For some reason I enjoyed the simpleness of the life. I enjoyed that what they wanted most was to be married and have children(at least that was our main characters, Emma's dream) and it was a simple dream and I liked it. I liked the fact that this in and of itself was a dream to aspire to. As a friend just recently reminded me I get to live my simple dream everyday and it brings me so much JOY! Maybe this is a weird thing to take from this book and you might read it and think I'm crazy, but that is what touched me. I might read it in a year from now and think I was nuts. OH well, for now I am enjoying the bubble that it created or me. What a fun quick read, a western romance. I was hooked from the first sentence! I can't wait to read more books by this author. A clean historical romance. A sweet, clean, western romance. A sweet, clean, western romance. A bit predictable and repetitive, but still a lot of fun. Full of endearing characters and a bit of adventure. The author gives beautiful descriptions that pull you into the story. I fell in love with the town of Thundercreek. I'm definitely impressed that this is the authors first published book and I look forward to reading more from her. Cute. Wish I had read it a few months ago for our book club, but better late than never. I hope she keeps writing, I love supporting writers who are bringing good things into the world. The door to the Marchant Inn swung open behind them, causing the bell to ring above it, and Emma turned around to welcome their unexpected guest. A broad-shouldered figure appeared in the doorway and stole her attention entirely. His spurs clanged against the wooden floor as he walked into the room, and Emma couldn’t help but notice his long, thick legs matching his barreled chest. The thin white shirt he wore clung to his biceps that bulged with each movement he made, and his shoulders stretched the fabric to what looked like ripping point. 3.5 but I'm rounding up. Let me just say, I love Marcia McClure. I love her cheesy dialogue and swoony kisses and exclamation points. This felt very Marcia-esque. I would be surprised if the author hadn't read Marcia's books because all those moisture-flooding-the-mouth kisses were very Marcia, but reading A Secret Fire was a pleasant way to spend an afternoon. I love a good, clean western romance and hope this author writes more! I almost finished this book in one sitting. Great plot, very believable characters, enough suspence and romance to keep a person wanting to read just a few more pages until you just have to go to bed. LOL Recommended!!! This was a great story of people learning to overcome their past. This was a sweet, clean romance with a little suspense as well. This was an adorable, fun read! I really enjoyed Emma even though I wanted her to have more of a backbone. She eventually doesn't let you down though. I enjoyed that there were so many characters that you just love. You love Emma, Thatcher, his brother and Emma's brother and sister in law. This was a fun, clean, adorable read! Thanks to the Happily Ever After book group on good reads I found another cute read. I read this book last year. It is one of those books you just don't want to put down. In fact I read it in just one night. I Couldn't wait to see how it ended. Beautifully written and a clean romance. You can't help but to be drawn into it and love it's characters. I would definitely recommend it!!! Awesome story! From the very first page it pulled me in and I couldn't help but read the whole story.. In one night... Even though it was 3:00 in the morning. The characters are so endearing, and I couldn't help but like them, even the notorious Nancy Jane! I recommend this book to anyone looking for a little extra romance in their life. It definitely hits the spot. This is one of my favorite books I have read so far this year. The plot was fun, the characters interesting, and the pacing of the story as it unfolded made this a book I couldn't put down until I was done. I can't wait for this book to be made more widely available so more can enjoy this great story! READ IT! I love historical fiction books...but when you add a little romance, I REALLY love them! This book is an easy read, you fall in love with the characters, and...best of all...it's CLEAN! I appreciate that greatly since there are so many "not-so-clean" romance novels out there. I highly recommend A Secret Fire to everyone! I don't like a lot of historical and western fiction, but this background story on the characters and their development has piqued my interest. Hathaway has done an excellent job in making me like historical fiction more. I don't like a lot of historical fiction, but this background story on the characters and their development has piqued my interest. Hathaway has done an excellent job in making me like historical fiction more. It was a sweet romance. A quick, easy read. I recommend it. This review was provided in exchange for a copy of the book from Goodreads Firstreads and the author. I loved this book! It was an easy read. I couldn't put it down, I was sad it had to end. I found myself smiling throughout the book. It was very clean, I definitely recommend this book! I have been looking for a clean romance story and this was the best one I have found in awhile! I really liked this story, I wanted to love it. I struggled with Emma's insecurity, it was driving me crazy! I loved this book. It was a page turner. It is a romance novel yet there was not anything inappropriate. Loved it!!!! I would highly suggest it for a fun easy read. Deborah M. Hathaway graduated from Utah State University with a bachelor's degree in English and an emphasis in Creative Writing. As a young girl, she devoured Jane Austen's novels while watching and re-watching every adaptation of Pride & Prejudice she could, entirely captured by all things Regency and romance. Throughout her life, she wrote many short stories, poems, and essays, but it was no Deborah M. Hathaway graduated from Utah State University with a bachelor's degree in English and an emphasis in Creative Writing. As a young girl, she devoured Jane Austen's novels while watching and re-watching every adaptation of Pride & Prejudice she could, entirely captured by all things Regency and romance. Throughout her life, she wrote many short stories, poems, and essays, but it was not until after her marriage that she was finally able to complete her first romance novel, attributing the completion to her courtship with, and love of, her charming, English husband. Deborah finds her inspiration for her novels in her everyday experiences with her husband and children and during her travels to the United Kingdom, where she draws on the beauty of the country in such places as Ireland, Yorkshire, and her beloved Cornwall.